It's bonus hop time!! And it is not Halloween themed 😉 It is actually my daughter's birthday on Monday, and she is pregnant with her first child. Like, really pregnant, going to deliver in the next month or less! 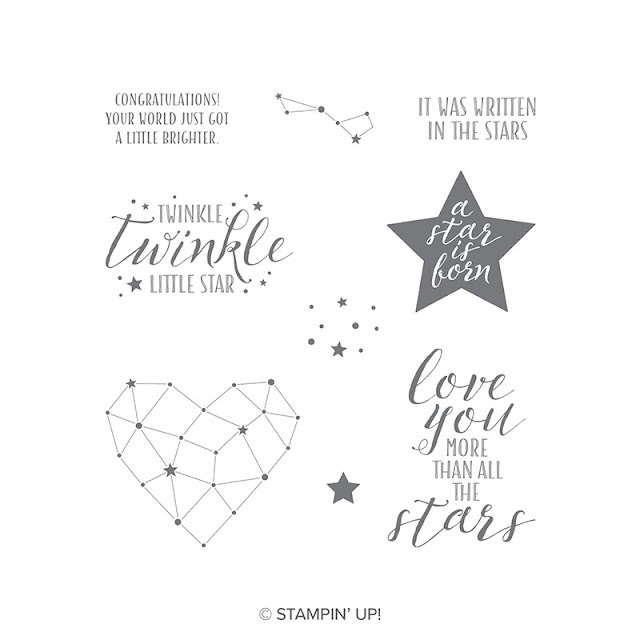 And when I saw the Little Twinkle stamp set, I immediately thought of the baby she was cooking up. So, what better time to feature this set than on my girl's birthday! 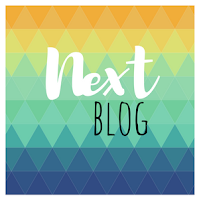 If you are following along in order, then you have just arrived from Mary Haugen's blog. Wow, right?! 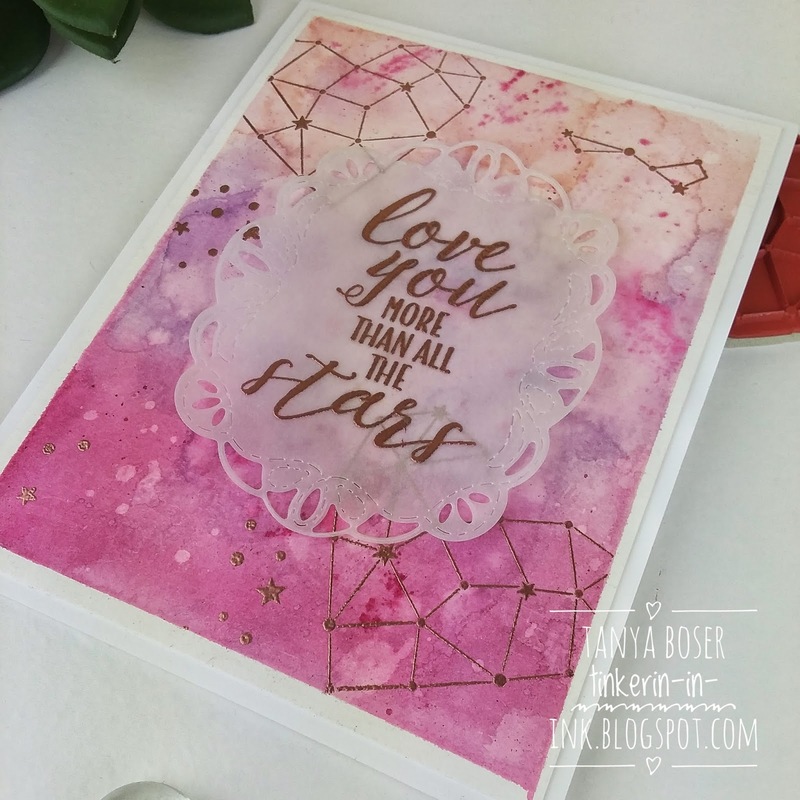 We think my newest grandbaby will be a girl, so I went with some pinks and purples for this card. Believe it or not, this is Powder Pink, Highland Heather, and Rich Razzleberry with Copper embossing. 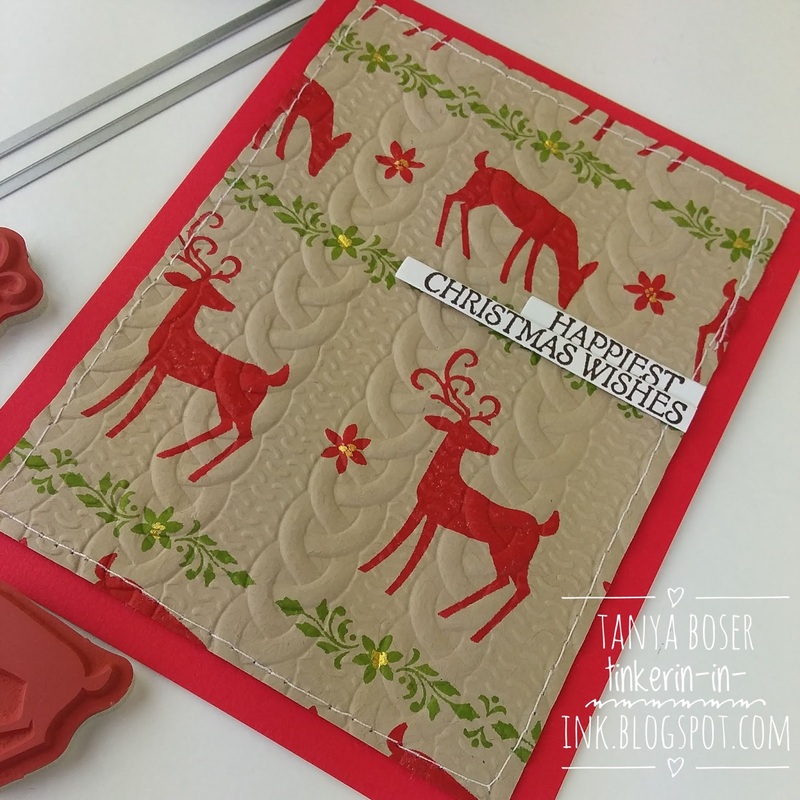 I love all the details on the Stitched Details diecut here. 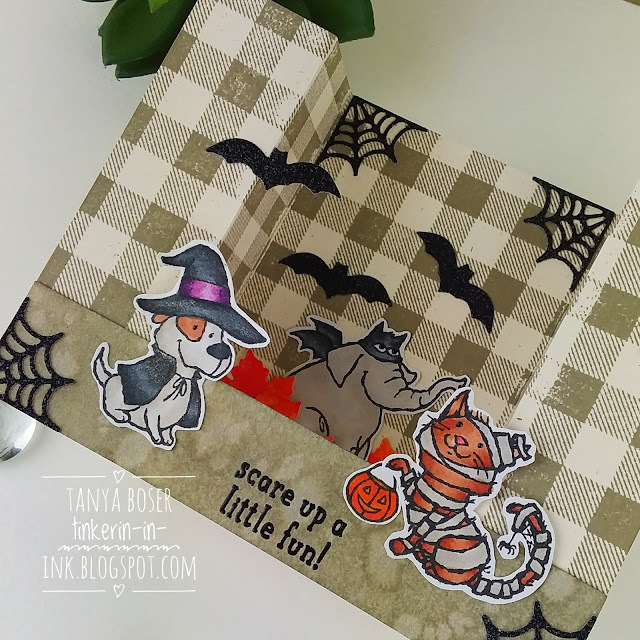 This card came to together super quick! That is all I had time to create this time. Life has been quite challenging for several months, and I have not had the time to dedicate to my crafts as much as I would like. 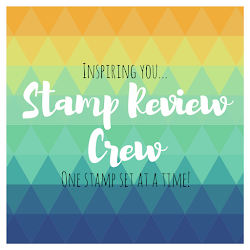 I won't go into to it here, because it is a long and rambling story with many side-stories, but I am very much looking forward to hanging with my stamping friends in Orlando for convention in just about a week!! Next up is the fabulous Charlet Mallett! I have been invited to be a guest designer on my dear friend, Kelly Kent's, team blog hop! What an honor! Thank you, Kelly! The theme is Toil and Trouble and Halloween. While I don't have the Toil and Trouble stamp set, I do have one of the other cute stamp sets: Trick or Tweet. 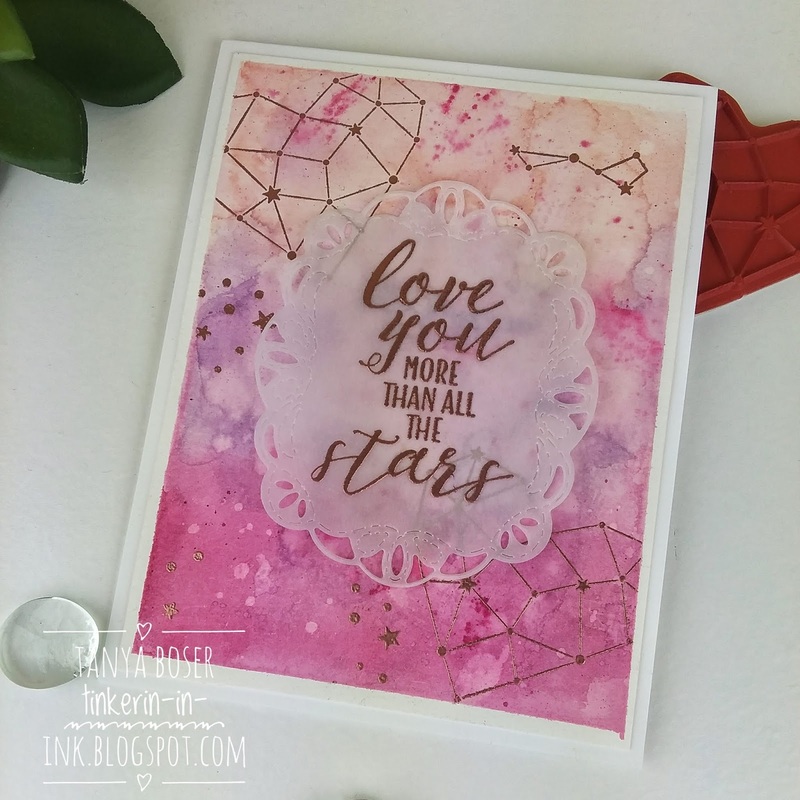 I created a bridge card, which is so easy, and so adaptable to what ever size you want it to be! 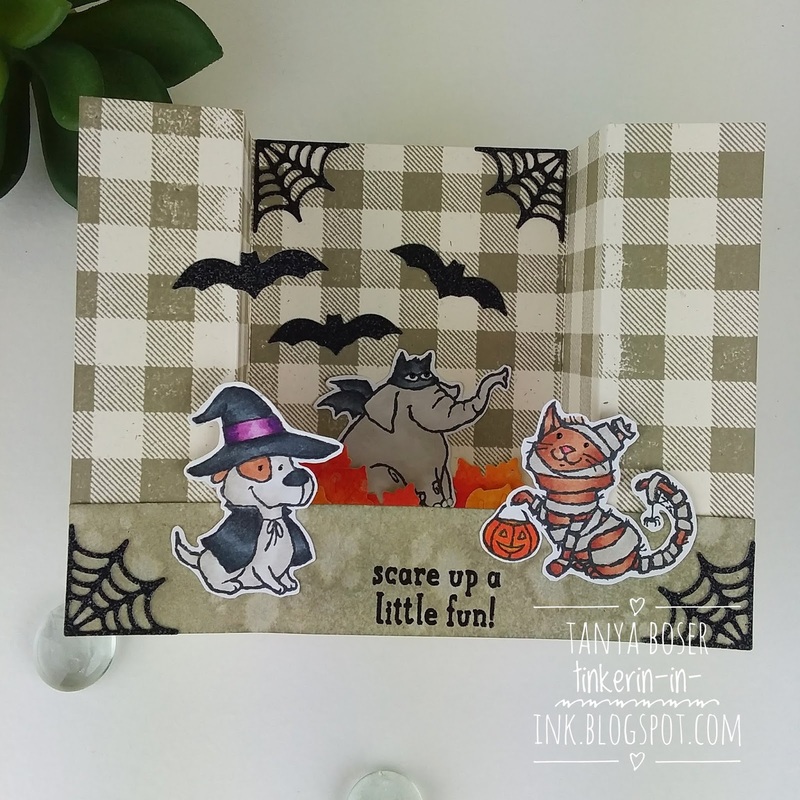 Buffalo Check and Seasonal Tags framelits came out to play with this card also. 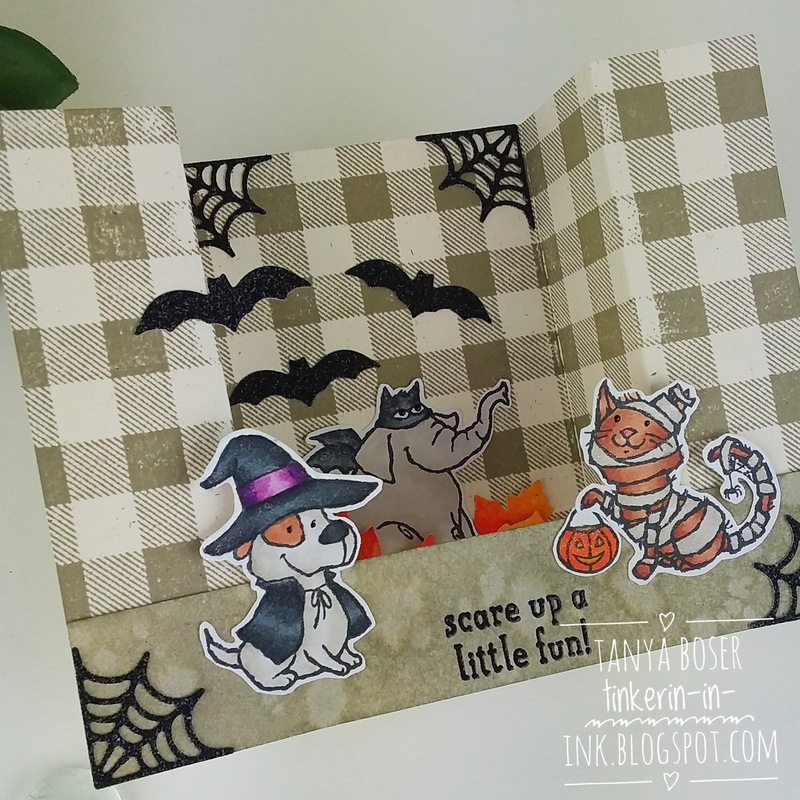 The critters are colored with Stampin' Blends and fussy cut. The leaves, spider webs, and bats are cut with the Seasonal Tags framelits. That elephant just had to be sitting in a pile of leaves, don't you think? I also love the way the Gray Granite ink looks sponges and spattered with water on the bridge piece. The fact that this card will stand up so easily makes it a perfect card to display all season long. I think I will bring it to work to sit on the registration desk! Oh, and the black glimmer paper is retired. Sorry! It is in my stash, and was begging to be used! 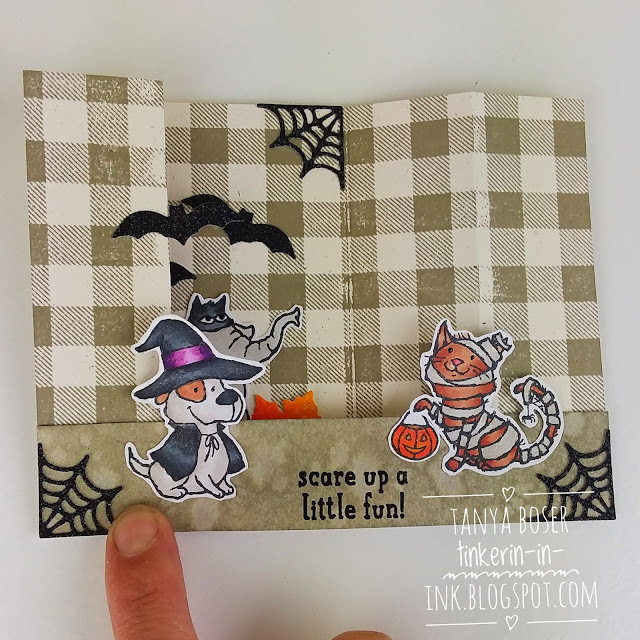 Bonus with this card design, it folds flat for mailing! All right, time to hop on over to the next blogger, Siobhan Fitzsimmons! 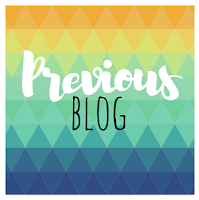 If you are following along in order, then you have just arrived from Mary Haugen's blog. Wow, right?! This lady has style! I was in a winter starry night mood, and I just got the Bokeh Dots set, so here is what I came up with! I love the delicate dies included in this bundle. Those swirls of leaves and flowers add the perfect icy touch. 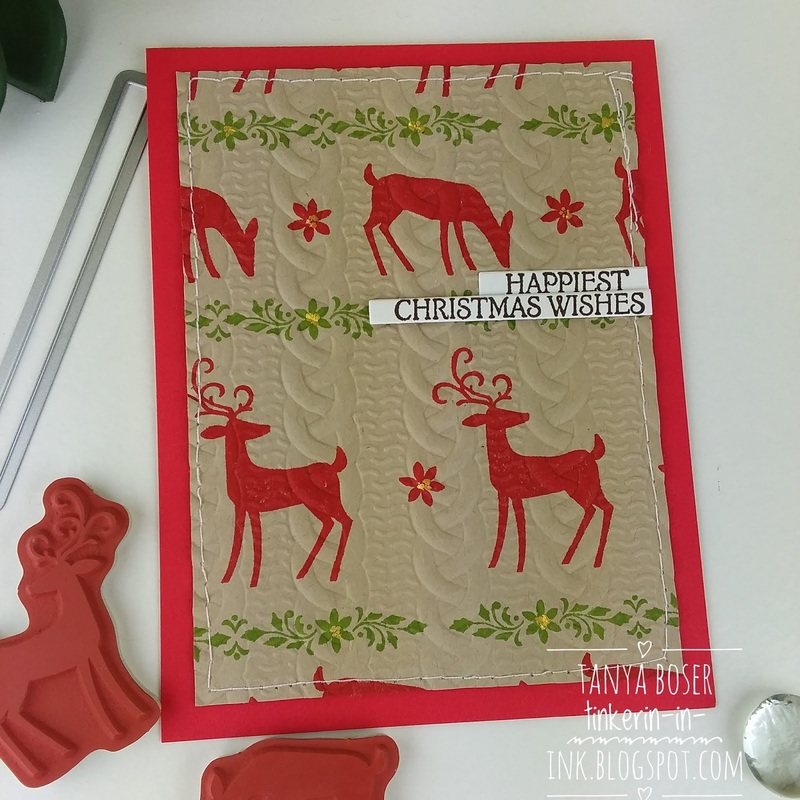 The Softly Falling embossing folder is a classic, and works perfectly with the feel of this card. That vellum banner was created using a die from Bunch of Banners. Next, I really wanted to play with a sweater themed card. I love sweaters. I am always on the look out for quality Nordic style sweaters. Someday I will own more than one! 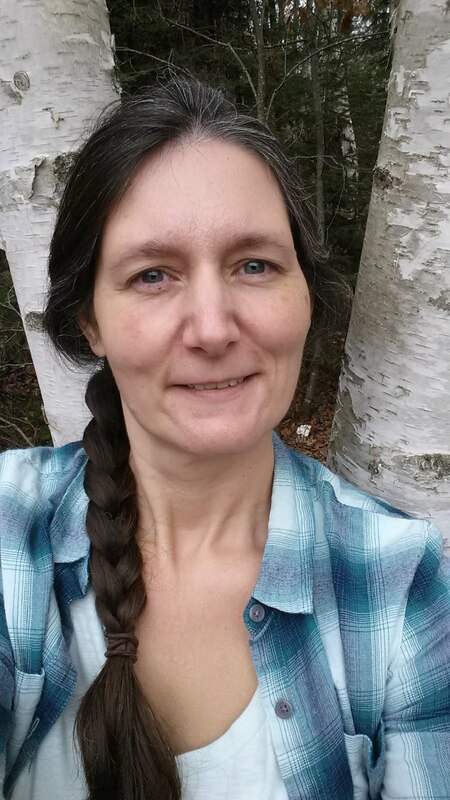 Since I live in northern Minnesota, sweater weather lasts for more than half of the year, lol! My Stamparatus made creating this panel a breeze! I used the Cable Knit embossing folder to enhance the sweater vibe. A watercolor brush with a nice pointed tip was very useful to apply the Vegas Gold shimmer paint to the flower centers. 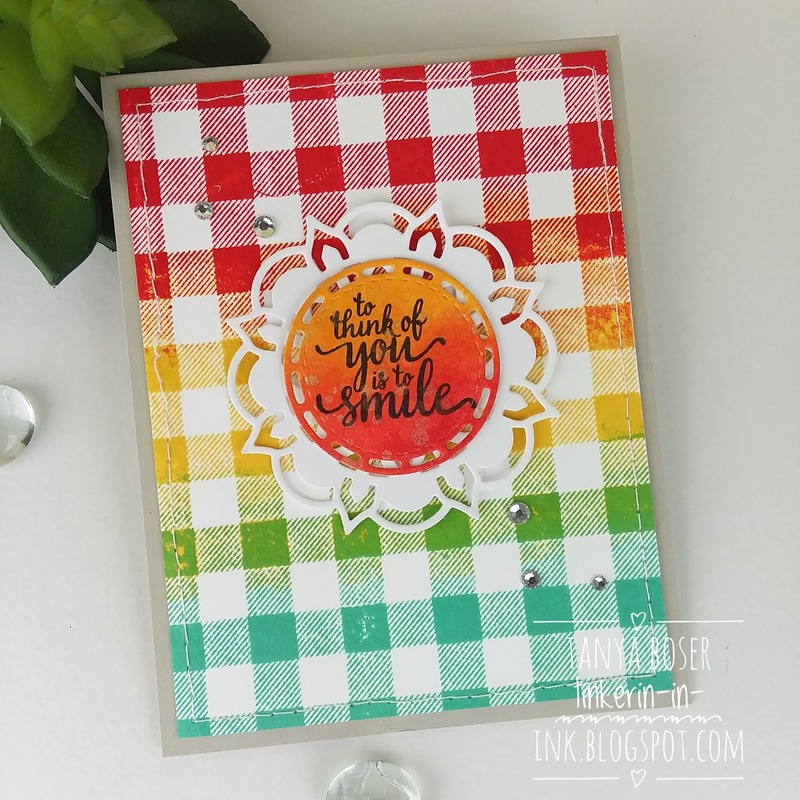 And those skinny sentiment strips? I used the straw die from Coffee Cups to cut those out. Slick, I tell you! Last up, that garland was begging to be featured all by itself! With the help of the Stamparatus, this pattern was stamped in Mossy Meadow, Old Olive, and Pear Pizzazz. Then the white cardstock was ink blended with Soft Sea Foam and Old Olive. And another piece of white cardstock was inked with Poppy Parade and got a white heat embossed sentiment. A die from the Farmhouse framelits made a lovely banner. OK, that's all I have for you this round! Next up is Heidi Baks, and she is sure to have something amazing too! So, I went a bit crazy with the Buffalo Check stamp when I got it. It is such a fantastic stamp!! This from a woman who owns no less than 5 flannel shirts, and actually wears them very frequently. Hey, they are very practical! Warm. Comfortable. Durable. Classic. Great for layering, and they keep the mosquitoes at bay in the evening in the summer! What's not to love? I had to do a rainbow of plaid, and I only used 3 colors to achieve this rainbow! I used Poppy Parade, Daffodil Delight, and Pool Party. The overlapping layers of color filled in the orange and green for me! 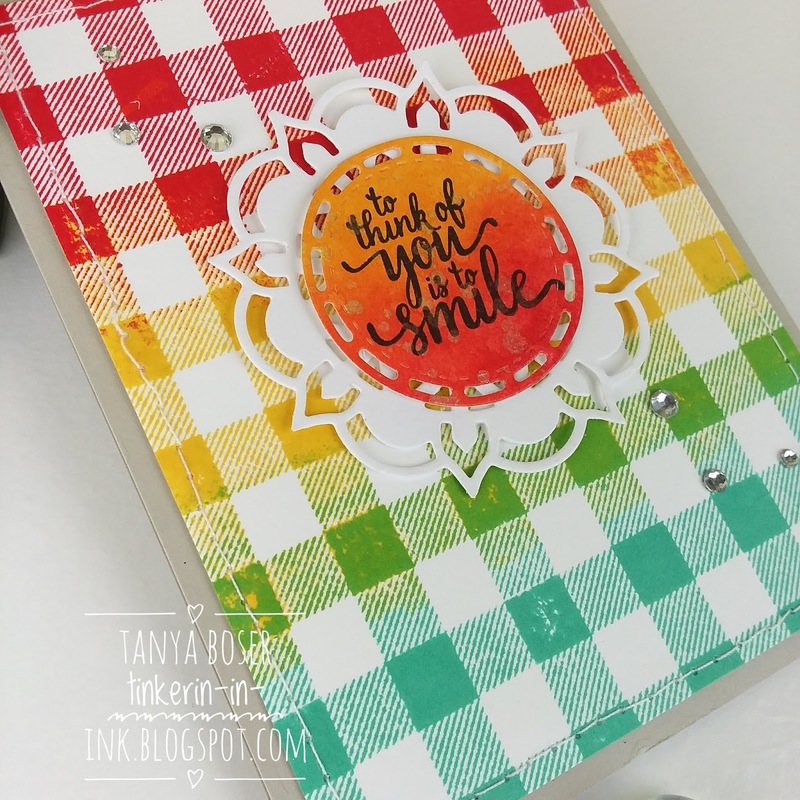 I used the Stamparatus to stamp this, adding each color individually. Sigh, I am in love with the Stamparatus! I don't even use my blocks very much any more. Not that I could live without the blocks, just that when I need to travel light, I can bring the Stamparatus and a single block and be good. The main image is added to a die cut from Eastern Medallions framelits, and the sentiment in from Eastern Beauty. 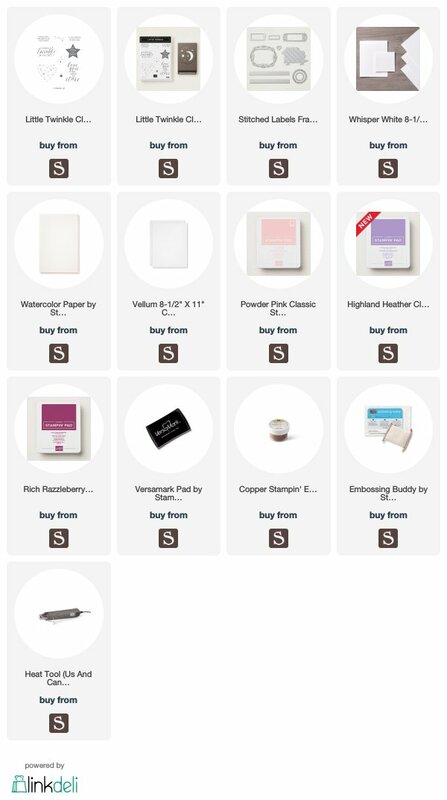 That is a forever keeper bundle, right along with Buffalo Check. 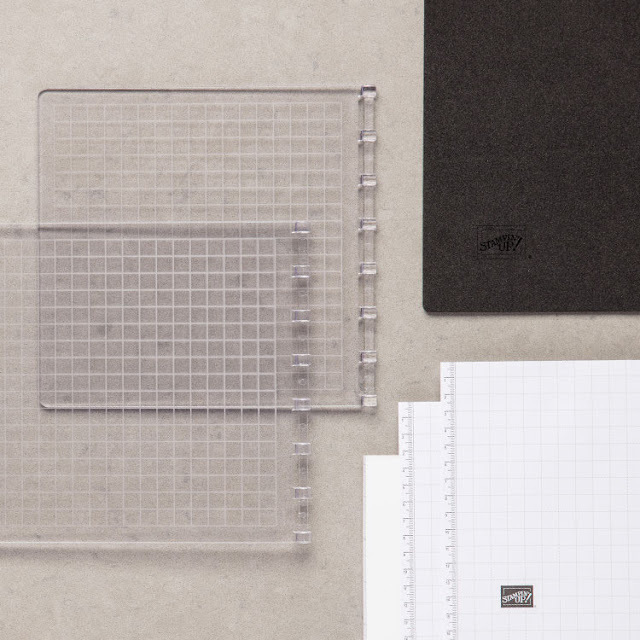 The sentiment is cut out with the Stitched Labels framelits, another must have. These are all things that I reach for frequently! 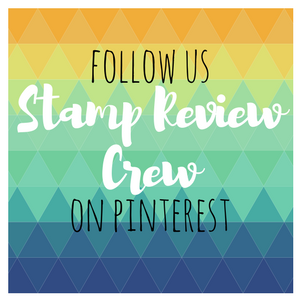 Did you notice that Stampin' Up! has come out with accessories for the Stamparatus? I am thrilled to be able to get extra plates in particular! When I am in a creative frenzy, I could easily used 4 or 6 of those plates! Now, dig out your flannel and have some fun!